(CN) — Hawaii’s Kilauea volcano shows no signs of slowing its flow of lava, which destroyed hundreds more homes overnight Monday. Lava from Kilauea continuing its voyage toward the sea after the initial major eruption on May 3 has taken 117 homes in the Leilani Estates and Lanipuna subdivisions of Hawaii’s Big Island. It then engulfed double that number in Vacationland and Kapoho Beach as it dropped steaming into Kapoho Bay, according to Hawaii County officials. Hawaii County Mayor Harry Kim lost his second home in Vacationland to the lava flow, which also threatens the Kapoho Beach vacation home of Wil Okabe, the county managing director, according to county officials. Thanks to an earlier evacuation, no injuries have been reported as a result of the most recent lava flows, according to county officials. Hawaii Volcano Observatory scientists conducted a flyover of the area on Tuesday after a 5.5 magnitude earthquake spewed ash a mile into the air at 4:32 a.m. Pacific time. The historical monthly average number of earthquakes for the island is 1,000, according to the U.S. Geological Survey. In the past 24 hours, the Hawaiian Volcano Observatory has recorded 344 quakes. Since the eruption began with the largest quake in the last 40 years at 6.9, nearly 10,000 earthquakes have followed, with more predicted by the U.S. Geological Survey. “We expect that earthquake rates will increase in the coming hours and culminate in another small explosion, perhaps within the next day, following the pattern of the past few weeks,” scientists announced Tuesday in a U.S. Geological Survey statement. The volcano currently has an aviation color code of red, which means the eruption is ongoing and releasing significant ash plumes into the atmosphere. Fissure 8, of more than 20, also spews a constant stream of lava across the eastern side of the island. 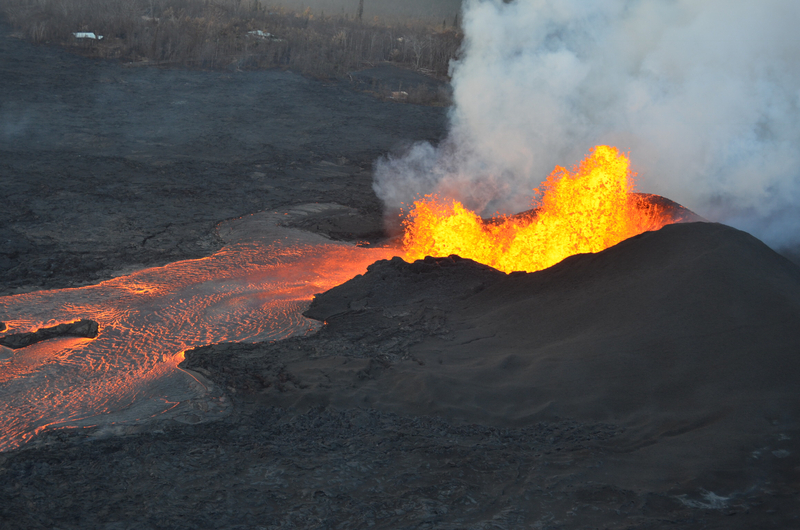 An observatory flyover confirmed that lava completely fills Kapoho Bay, extending 0.7 miles from the former coastline. To the south, lava enters the water at the Vacationland tide pools, most of the subdivision inundated. To the north, lava has covered all but the northern part of Kapoho Beach Lots. The northernmost lobe of the Fissure 8 flow, in the Noni Farms Road area, advanced downslope about 200 yards overnight. Officials warn those close to Kapoho Bay to stay 1,000 feet away from the ocean entry site, due to hazardous emissions called laze. Laze is a mixture of fine glass shards, hydrochloric acid, and steam that can blow inland toward residential areas as molten lava meets the sea and causes the water to boil. Most of Hawaii Volcanoes National Park remains closed due to earthquakes, corrosive volcanic ash and explosions from Halema‘uma‘u, the summit crater of Kilauea. At the Malama Kī Forest Reserve, forest managers reported that the eruptions have affected up to half the forest’s 1,514 acres. The forest serves as habitat to sub-populations of native birds, including Hawaiian honeycreepers, the Hawai‘i ‘amakihi and ‘apapane, according to a reserve statement.